Like its titular character, Missing Link is a bit of a mixed breed. An animated family adventure, its humor is more dry than zany, with a stellar voice cast and an often sophisticated air to its snappy dialog that is centered around a lonely Sasquatch. And it looks freaking gorgeous. Hugh Jackman brings charming life to Sir Lionel Frost, an ambitious, self-centered 1800s explorer on the trail of any big discovery that can get him admitted to the prestigious adventurer’s club led by the aggressively pompous Lord Piggot-Dunceb (Stephen Fry). A hot tip leads Frost to a face-to-face with the fabled missing link between man and monkey who, as it turns out, provided that hot tip. See, “Mr. Link” (an endearing Zach Galifianakis) is lonely, and figures Sir Lionel is just the guide savvy enough to lead him to his people, the equally urban-legendary Yeti tribe of Shangri-La. So our heroes set off across the globe, enlisting the help of Frost’s old paramour Adelina (Zoe Saldana) while they try to outwit Stenk (a perfectly villainous Timothy Olyphant), the assassin sent to stop them. This is the latest animation wonder from Laika studios, and the follow-up to 2016’s amazing Kubo and the Two Strings. Even if Mr. Link’s adventure wasn’t as engaging as it is, the film would be worthy on visuals alone, as you’ve barely digested one “wow” moment when another is there to blow your hair back. From the texture of Frost’s gloves to the ripples in a puddle, from a slow dissolve into a binocular lens to a wide, eye-popping set piece on an ice bridge and beyond, Missing Link serves up a hearty feast of cutting-edge stop motion technology. 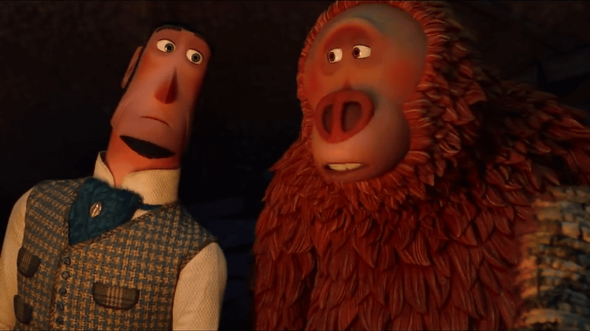 And while the pace may leave the youngest viewers a tad restless, writer/director Chris Butler (Laika’s ParaNorman) crafts a heartwarming, witty and intelligent tale anchored in the layered relationship of Frost and Link. Jackman and Galifianakis make them a wonderfully odd couple, and play off the indelible supporters around them (including a gloriously droll Emma Thompson) to keep all the globe-trotting character driven, leaving just enough room for the messages about inclusion and progress to be subtly effective. The result is a film that’s confident but unassuming, fun without being silly, and satisfying from nearly every angle.